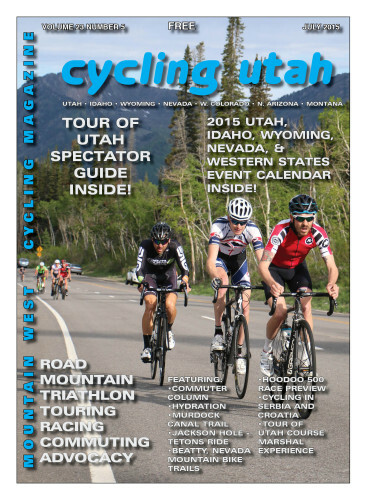 Cycling Utah Magazine's July 2015 Issue is now available as a free download (9 mb download), Pick up a copy at your favorite Utah, Idaho, Wyoming, Nevada, Montana, W. Colorado, N. Arizona bike shop or other location! Cover Photo: The Pro/1/2 Men's break at the Porcupine Big Cottonwood Hill Climb on June 6, 2015. Chris Mackay, race winner Mitchell Peterson, and Cameron Hoffmann dig deep.